Dayna Olson of North Platte, Neb., plays with Jamaican school children during a University of Wyoming alternative spring break project last year. While many students travel to warm places for fun in the sun, 60 University of Wyoming students and team leaders this week are volunteering for service projects in six different locations in the United States and abroad. Alternative spring and winter break projects are sponsored through the Wyoming Union's Service, Leadership and Community Engagement Office (SLCE) office. The alternative breaks program provides an opportunity for students to work on community-based service projects, both nationally and internationally. Students spend their winter or spring break addressing a variety of issues ranging from homelessness and social issues to environmental preservation, says Scott Headrick, a geography senior from Black Hawk, Colo. He coordinates the program with Jen Lang, public administration master's degree candidate from Scottsbluff, Neb. During UW's spring break (March 14-18), student volunteers and team leaders are in Florida at Everglades National Park, San Francisco and southern Utah. 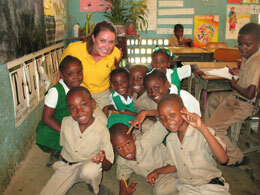 Internationally, students are volunteering in Costa Rica, Belize and the Dominican Republic. "These trips allow students the opportunity to travel to places they might not be able to without the program. One thing students take away from these trips are lifelong friendships," Headrick says. "Our program also provides great leadership opportunities that students will use in the future. Internationally and domestically, we provide life-changing volunteer experiences and students spend the week emersed in different cultures." He adds a key part of the program is bringing the students' new-found sense of community engagement back to campus and the Laramie community. -- Everglades: Students will be at both Everglades and Biscayne National Park doing environmental work, removing trash from beaches and other park clean-up chores. They also will remove invasive plants from the parks. -- Southern Utah: Students will work at Best Friends Animal Sanctuary, a large sanctuary that takes in abused animals from across the country. UW students will help care for the animals and with the upkeep of the facilities. -- San Francisco: The focus on this trip is hunger and homelessness issues. UW students will work in various food banks, community gardens and also spend a few days building a house with Habitat for Humanity. -- Dominican Republic: Students will work in an orphanage in a small rural town near the Haitian border. Students also will teach English classes and work on improvement projects at the orphanage. -- Costa Rica: Students will stay with local host families for the week. They will work in local schools in a San Jose suburban area, focusing on teaching young children. -- Belize: Students will stay with local host families. The trip is an environmental focused-project. Students will volunteer at a local sustainable farm and also work at a butterfly house to help collect and preserve butterflies. UW's Alternative Breaks program started in March 2006, when a group of 50 students traveled to Waveland, Miss., to help with Hurricane Katrina relief work.